Frank Cashen in August 2010. John Francis Cashen (September 13, 1925 – June 30, 2014) was an American Major League Baseball general manager and writer. He is often said to have turned the New York Mets into champions with choosing their squad. He was also an executive while the Baltimore Orioles won the 1966 World Series and 1970 World Series. Chashen was born in Baltimore, Maryland. He gradated from Loyola University Maryland. He had seven children with wife, Jean: Gregory, Terry, Tim, Brian, Sean, Stacey and Blaise. Cashen died on June 30, 2014 in Easton, Maryland, aged 88. ↑ Goldstein, Richard (June 30, 2014). 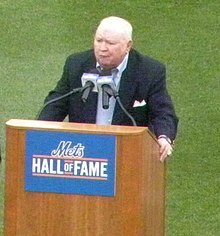 "Frank Cashen, Executive Who Turned Mets and Orioles Into Champions, Dies at 88". The New York Times. Retrieved July 1, 2014. ↑ Rubin, Adam (June 30, 2014). "Frank Cashen dies at age 88". ESPN. Retrieved July 1, 2014. Wikimedia Commons has media related to Frank Cashen. This page was last changed on 20 January 2019, at 14:19.